Trinidad is a beautiful colonial town that you can’t miss on your trip to Cuba. 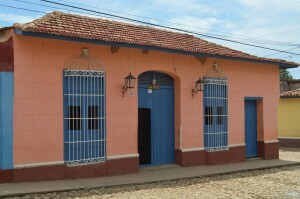 It is located in the south of the central province of Sancti Spíritus and is known as “museum city of Cuba”. Trinidad was the principal location of sugar cane production on the Island in the 18th and 19th centuries because of the proximity to the Valle de los Ingenios. It was a place of great wealth during that period, which is evident in the fine decorations of the buildings, many of which are now public museums. In each architectural work of Trinidad its culture, folklore and history are represented. The city has one of the best preserved colonial architectural complexes in Cuba and even in America, with different and mixed construction styles. It is a city of narrow and winding cobbled streets. Buildings have decorated walls, beautiful works in wrought iron and precious woods, and artistic balconies and interiors. It has around fifty palaces, majestic churches, parks, convents, and bell towers with incredible panoramic views that deserve to be admired by all who visit this wonder. For all this, Trinidad was declared as World Heritage Site by UNESCO in 1988. In 2018, Trinidad received the status of Craft City of the World by the World Handicrafts Council (WCC). The expressions of the crafts made and exposed there, are a source of considerable income for many families which transmit that knowledge from one generation to the next one. Embroidery and needlework are a sample of this; they have an amazing diversity and are part of local daily life. Walking through the cobbled streets, you can buy authentic handicrafts from this region of Cuba, made with “yarey” fabrics (natural fiber), earthenwares and sculptures, and clothing made and woven by expert hands. All the pieces elaborated by the Trinitarian artisans include all the history of the most genuine Cuban traditions. Craft fairs, together with the architectural and historical values of this town, constitute a point of considerable attraction for foreign visitors. 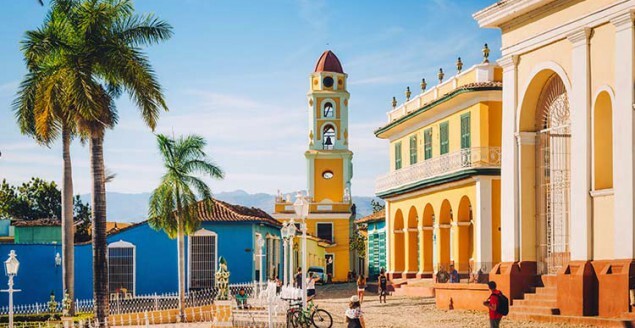 Trinidad city is one of the destinations in Cuba (along with Havana, Varadero, and Viñales) where tourism has very significant participation. There are several small hotels such as La Ronda and the Grand Hotel Iberostar Trinidad, and for sun and beach tourism, the Ancón Hotel, the Amigo Costasur Club and the Memories Trinidad del Mar stand out. But there are also more than 400 casas particulares in Trinidad that provide accommodation services. They are perfectly preserved, and most of them have air-conditioned rooms and private bathrooms; these are spectacular and different options for visitors. A sample of this type of accommodation is Casa Lorente, where its interior patio and its completely colonial structure stand out. Other lodgings, perhaps with a less colonial style, stand out for their beauty, comfort and unequaled treatment from their hosts. Examples of this are Hostal Casa Lito and Hostal Merlyn. There is also the fact that you will wake up every day breathing very pure air, with the aroma of Cuban coffee, listening to the roosters crowing around you, and enjoying an excellent breakfast, and in the afternoon a typical Trinitarian meal, so this starts to become a wonderful offer. In this city converge, on the one hand, the tours within the city, the beaches and the mountains, and on the other, the casa particular, the contact with the Cuban family and lower prices than in any hotel. So, the accommodation won’t be a problem for tourists, except in extremely high season of tourism, however, it is always advisable to book it in advance to ensure a better option. You can consider Casa Particular Cuba to choose the best accommodations in Trinidad city, as well as in Playa La Boca, a peaceful and paradisiacal place by the sea. Trinidad is a beautiful colonial city which you will love just by walking its cobbled streets. Downtown, around the main square, is completely pedestrian, which makes much easier to explore each corner, without bumping against a typical carriage or any other vehicle. You will also find with beautiful street markets selling typical clothes, handbags, and various souvenirs. The picturesque Plaza Mayor is also located in the Historic Center of Trinidad, and almost all the streets of this historic town converge there. In its surroundings, it is possible to find very beautiful colonial houses as well as some of the main tourist attractions of the city such as the Church of the Holy Trinity (the largest in the whole country), the Museum of Colonial Architecture, the Romantic Museum, the Museum of Archeology and Casa de la Trova, among many others. Another very attractive place in the surroundings of Trinidad is the Valle de los Ingenios or Valle de San Luis, declared by UNESCO a World Heritage Site. Located a few kilometers from the city, it is a real museum of the Cuban sugar industry of the 18th and 19th centuries, with valuable archaeological and historical sites such as the 65 ruins corresponding to sugar mills, summer houses, and slave barracks. In this area there were 44 sugar mills that gave such an economic boom to the region and Trinidad came to be considered the third most important city in the country, after Havana and Santiago de Cuba. There is located the famous tower of Manaca-Iznaga, 45 meters high, built in 1816. Its bell marked the beginning and the end of the daily work in the sugar cane plantations. In the Valle de los Ingenios there are also colonial constructions in perfect condition, such as the 11 houses of landowners of sugar plantation that are still preserved, and some sugar complexes such as the San Isidro de los Destiladeros plantation, all of this inserted in the natural beauty of the landscape. This area, of unparalleled natural beauty, can be appreciated from a viewpoint in Loma del Puerto at 276 meters above sea level, with a spectacular view. For greater attraction of the visitor, you can go there by a small tourist train that leaves from Trinidad and makes a tour of the entire valley. Located about 10 kilometers from Trinidad, it is a beautiful beach of white sands and calm and crystalline waters with 4 kilometers of extension; it is considered by many as the best beach on the southern coast of Cuba. Its serene waters make it perfect for the practice of water sports such as snorkeling or diving (there you can rent the necessary equipment for this). On this beach, you can spend an afternoon enjoying some cocktails and watching the sunset. For greater attractiveness of the place, you can make a small boat trip from the beach to Cayo Blanco, just a few kilometers from the coast. In that area, there are 3 hotels where you can have a snack or have lunch in the restaurants on the beach. This could be an excellent day trip if you are staying in a casa particular in Trinidad. You can make a really short trip by taxi or bus or, if you are more adventurous, you can rent a bicycle in the town and in just one hour you´ll be there. On foot, on horseback or by car you can explore this National Park, an ecological reserve of the region, located a few kilometers from the historic center of the city. Topes de Collantes is also the habitat of our national bird, the Tocororo, currently in danger of extinction. There you will find beautiful waterfalls such as the Salto del Caburní, 62 meters high, which is reached after a long walk through coffee plantations. Once there, you can cool off by taking a dip in its clear waters. You also have the opportunity to visit La Batata, which is a group of caves that have natural ponds with medicinal properties. This will definitely be a pleasant experience! In Trinidad there are many restaurants, both in the city and in the excursion sites, where exquisite dishes of international and national cuisine are served, such as fish, really fresh, since the city is very close to the sea. You should also enjoy the “canchánchara”, a typical drink made with sugar cane liquor, honey and lemon juice, served in earthenware pots. Try these wonderful things; it will always be indispensable in your trip. However, those who stay in a casa particular will also have the opportunity to taste the typical food with the additional advantages of “homemade” food, more careful, and personalized than in public restaurant. The city itself is Trinidad’s main attraction: admire its cobbled streets and squares, the preserved houses and buildings of colonial architecture, their natural places; feel the atmosphere of a splendid past of what was one of the richest cities of the Island; visit its museums and churches; enjoy the nightlife and culture of a region full of traditions, are, without a doubt, an experience that must be lived at least once in life. Casas particulares in Trinidad will add attraction to the proposal because guest attention is personalized. Visitors will feel an environment difficult to appreciate in other Cuban cities. One thing is for sure: there is a lot to do in Trinidad, except to get bored.